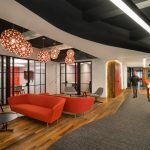 Cape Town communication agency 99c went through an extensive study of employee behavior with Inhouse Brand Architects to design an activity-based office that suits them perfectly. A shipping container turned conference room. Image courtesy of Inhouse. 99c is a communication agency in Cape Town, South Africa. 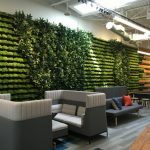 Before they moved into their new offices, a team of designers and architects from Inhouse shepherded the company through an extensive review of their daily activities. The study allowed Inhouse to evaluate the employees’ needs from the perspective of activity-based work principles and provide 99c with the most effective, tailored-to-them space layout possible. The tailoring shows up in everything from a conference room housed in a shipping container – “it exists to produce creative solutions that are shipped around the globe, just as the container, in its original form, is a quintessential method of moving goods around the planet” – to zones that allow for all types of interaction. For example, “high-focus” zones contain individual desks, while “high-communication” zones were defined as spaces that encourage teamwork. It was important that our new office space not only expresses our creativity but also encourages and enhances it. Scroll on for more photos and details. All areas have a function. The main podium staircase doubles up as seating for large meetings internally and the shipping container is not only used for meeting spaces (internal) but the top “roof” is a “deck style” seating area for meetings or lunch. The top of the staircase doubles up as seating for large meetings. Image courtesy of Inhouse. The building is in walking distance from bus stops, not even 5km from the main high way off-ramp and also walking distance from the main train station. Which furniture brands and dealers were used? Please touch upon any notable products, how they were used, and if they solved a specific problem. Dag was used for most of the made up upholstery items, new office desking systems were supplied by Ergoform. Casual cafe style chairs and tables from Chair Crazy, Sean Williams, and Ergoform. The “roof” of the shipping container conference room is a “deck style” seating area for meetings or lunch. Image courtesy of Inhouse. The shipping container echoes 99c’s purpose – it exists to produce creative solutions that are shipped around the globe, just as the container, in its original form, is a quintessential method of moving goods around the planet. With the office’s panoramic views of container ships in the harbour, the waiting room serves a subtle reminder to 99c employees of the importance of client service and delivery. Like the quantity of the open space. The ratio to other spaces will be high. Probably all is lookefd at as productive.